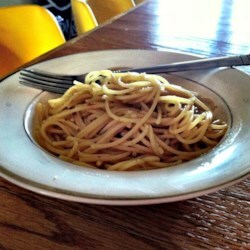 "A spaghetti dish with garlic and Italian dressing mix. Quick and delicious! Can add canned shrimp if desired." Bring a large pot of lightly salted water to a boil. Cook spaghetti in the boiling water, stirring occasionally until cooked through but firm to the bite, about 12 minutes. Drain and transfer to a serving bowl. Heat olive oil in a skillet over medium heat; cook and stir garlic in the hot oil until lightly browned, 2 to 3 minutes. Mix water and salad dressing mix into garlic; simmer until liquid has reduced into a sauce, 5 to 7 minutes. Pour sauce over spaghetti; toss to coat.